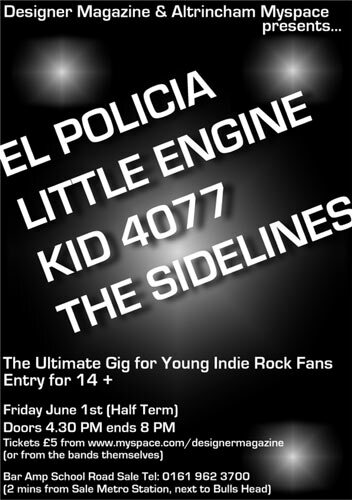 Designer Magazine and Altrincham Myspace present the ultimate all ages (14+) gig in South Manchester for half term. Cool as f**k band from Chorlton. Expect these guys to be one of the talking points of this years In The City showcases with huge radio support from Conrad Murray on Revolution Radio. Manchester's next generation fronted by Nile Marr on guitar vocals. Joined by Jamie Safiruddin on bass and Tom Abbott on drums. The band have only played a handful of gigs which has already gave them national airplay on Desert Island Discs and the band are currently recording their self-titled debut album. Bar Amp is literally 2 minutes walk from Sale Metrolink Station. Turn left out of the station and walk through Sale Precinct and its at the end of their on the right. Its next to the Bulls Head - so ask your parents - 102 School Road Sale. Altrincham Myspace went in to the refurbished and brand spanking new Griffin on Easter Monday to check out how it had changed.Initial impressions were good, looked classy but it was obvious it was not the pub of old. With the smoking ban coming into place soon it was obvious they were going for what's now c*ntishly known as a Gastro-pub i.e its not a real pub, not a real restaurant but somewhere in between. Atmosphere was soured when Original Hogg asked for crisps. No crisps sir. Nuts?? No nuts sir. We dont serve snacks or something similar was muttered. Now we know Altrincham's trying to shift into upmarket bars but this is taking the p*ss. Overall impressions are that we can see its try to differeniate itself from the Stamford next door which is now scallys paradise, but with Deckers across the road why would you want to eat there. If you've been there what do you think? Please leave your thoughts and comments for Capt Chris Air...one of the 15 hostages in Iran at the moment. 1ST APRIL - Why do we all think Alty's the best town in Manchester? ...what is it about Altrincham that makes it better than all these towns South of Manchester? Altrincham has a longstanding connection with music whether its the Rolling Stones and The Who playing early gigs here; Manchester bands such as The Stone Roses and Doves forming here....or the likes of Morrissey, Johnny Marr and Bonehead from Oasis moving here after they made it.But enough of looking at the past...what will be the bands that put Altrincham back on the musical map. 20TH MARCH 2007 - HAS TESCO'S RUINED OUR TOWN CENTRE? Controversial subject matter for many in Altrincham and one subject to TV Documentaries about Town Centre's in the UK, but has the arrival of Tesco's in Altrincham ruined our shopping centre. We've been thinking this for a while but seems we're not the only ones as the Manchester Evening News review of Chisnalls (nice little delicatessen / cafe near Alty Market) on Friday 16th March summed it up quite smartly about the enormodome of tesco's "Useful, yes, massive, certainlym but friend to the small businesses, niche shops and overall health of the local high street. Perhaps not so much".So what do you think? Was Alty better before Tesco's and were Sainsbury and Kwik Save just enough for our needs but not too intrusive in the town centre...or were they just as bad. 11TH MARCH 2007- ROLLING STONES RONNIE WOOD SAYS ALTRINCHAM WAS BEATLESMANIA! Q:Did The Birds have any success? A: Beatlemania! But only in Salisbury and Altrincham (laughs). In those two towns they'd want a piece of you, pull your hair out in clomps, tear your clothes. Then we'd play a working men's club in Amersham or Redruth, all that way in the Transit for a fiver each and the audiences would be wallflowers, like this is f*cking boring!" * How much is is? Value for money or what? * What facilities in terms of bars / snacks do they have in there? * how does it compare to the old one? And is it worth the wait? * does it look like a temporary ice rink inside? 24TH FEB 2007 -ALTY METROLINK STATION - Do you feel safe and assorted metrolink questions? manchester so travel on my own from Alty. Do you know who I can contact? and ask what is being done about it. Ive lived in Alty all my life nearly and never seen this sort of trouble!! " 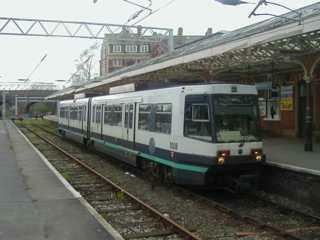 * What do you think of the Metrolink service in general? * How much in percentage times would you say it's late? * Do you think it's too expensive or just right? * Do you feel safe if you have to get on or off a tram in Altrincham at weekend? What incidents have you seen recently? * What would you do to make Altrincham Metrolink stop safer? * Do you believe the service will get worse once the extended routes come in place in the next couple of years? 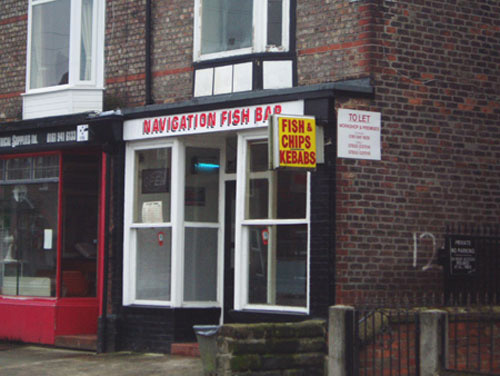 WHICH IS THE BEST CHIPPY IN ALTRINCHAM? So how many of you knew it was National Chip Week this week (12-18th Feb)? 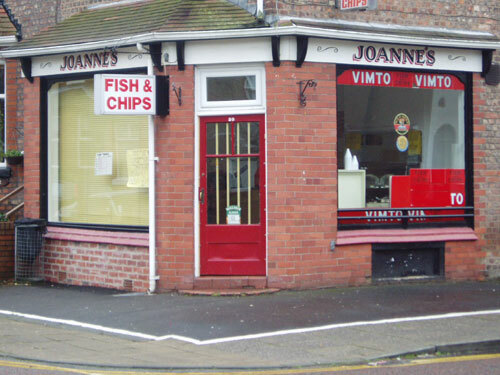 At the Altrincham Myspace we found out about it approximately a month ago and have decided to find out which is the best Chippy in Altrincham. * For this week especially please avoid multinations fast food outlets such as Subway, McDonalds, Pizza Hut and support these local chippys. 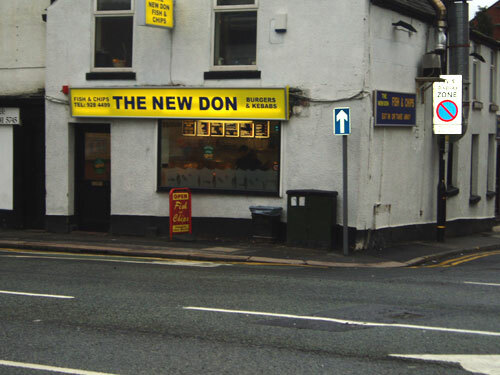 10 Navigation Rd, Altrincham. Cheshire. WA14 1NF. * Do you have a weekly chippy night? 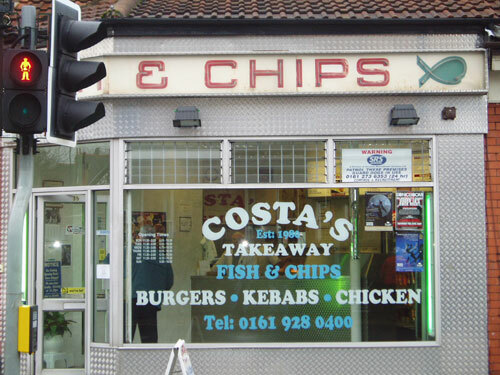 * If you dont go to a chippy but go to other take aways - why dont you go to chippys? 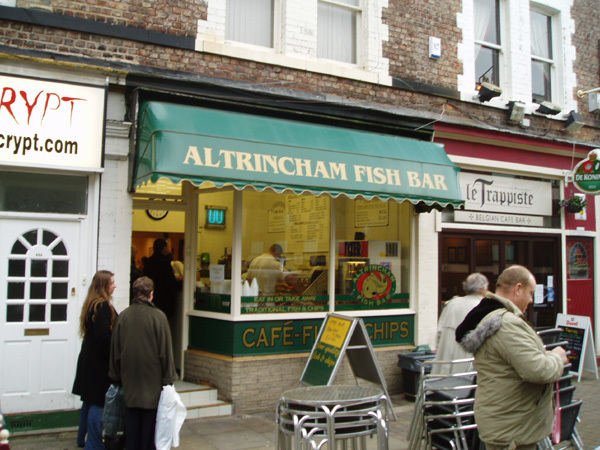 NOTE: VOTING FOR THIS BLOG WILL END AT MIDNIGHT ON SUNDAY 18TH FEBRUARY WHERE WE WILL TOTAL THINGS UP AND LET THE LOCAL PRESS / MEDIA KNOW WHICH CHIPPY YOU HAVE CHOSEN AS THE BEST IN ALTRINCHAM....feel free to leave comments after this time but only votes up to the date above will be counted in our poll.